Phew ! Our Tour de Furness 2018 is over. After several months of behind the scenes activity, our day began on Sunday morning (9th September 2018) at 06:00 hours. It was dark, wet and windy and the last place anyone wanted to be. With horizontal rain it was not going to be a good day for a cycle ride. We had 355 riders entered and needed to get everything ready for the first ones who would be champing at the bit to start by 07:00. Our team, swathed in waterproofs, head torches glowing, swarmed into the Cons Club concert room, which the Club Committee had kindly allowed us to use for temporary storage. Lots of huge black and blue bags were hauled out, gazebos loaned to us by the "Keswick to Barrow Walk Committee" and "Dalton Community Association". Two were immediately loaded into vans and whisked off to refreshment stops at Leece and Urswick. The remainder were scattered around the club car park and after unpacking each great bag, with much pulling, pushing, grunting and occasional swearing, the gazebos were erected and at least we now had some shelter from the rain which was now easing as the light also improved. A trailer load of tables was emptied and our registration desks and more importantly our refreshment station were now taking shape. A pile of plastic chairs was dispensed and then a load of plastic crates containing numbers for our riders, list of the riders we had registered, pens, pencils, coloured markers, safety pins, wrap lock ties - was unloaded and shared amongst the desks. Our volunteers had also arrived and assisted pinning up the various notices needed; helmets to be worn, rules of the road, maps for those unsure of the routes etc. Now light, it was 07:00, and our first riders were ready to go, and they were due in Manchester for another event later in the day! Names were checked off, numbers issued, wrap locks tied to their cycle handlebars and they were away. Our radios had all been switched on, checked they were on channel 1 and shared out, main gate, car park, 50 mile desk, organiser Brian. Last but not least to our strategic communications caravan operated by our friends from the local ham radio club "FARS" (Furness Amatuer Radio Society). This is the 3rd year they have assisted us. They operate a radio net between stations at Coniston, from the Walna Scar road on the flanks of Coniston "Old Man", to our control in Coniston Village, to a Mobile Sweep Vehicle which travels along all of our rides. In an area where mobile phone coverage is at best not great, they provide us with a valuable service. Our riders are now coming in thick and fast. We tell Colin of the FARS Team our provisional numbers which they pass onto Coniston, and our new mobile marshalls have reported in. 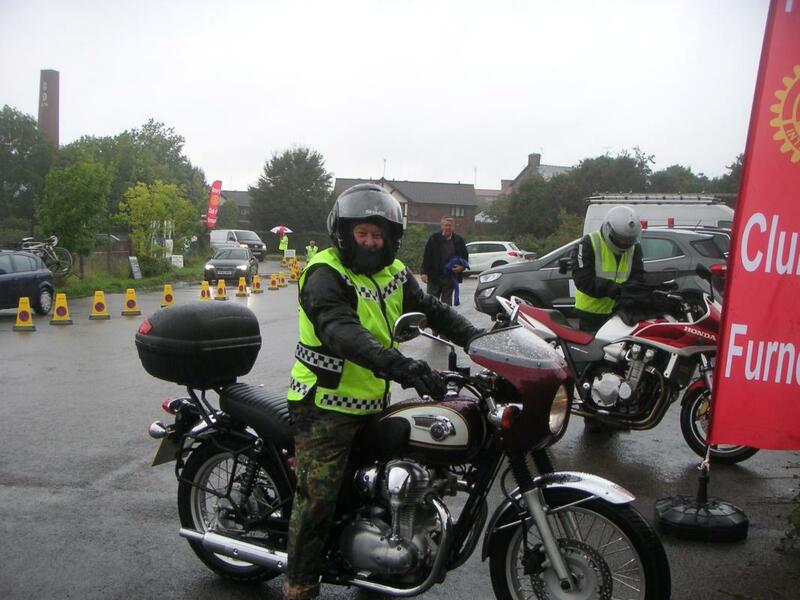 Two keen motorcyclists with experience of marshalling other events are being used as an experiment in addition to our stationary ones. 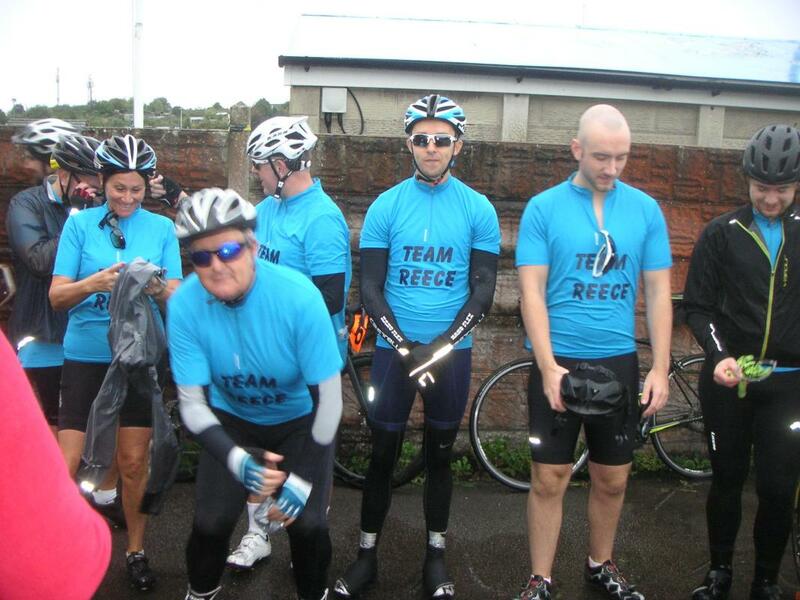 In actual fact they proved to be very popular with our riders who were reassured by them being frequently in view. It also worked for us when they reported back problems which had occurred on the route. 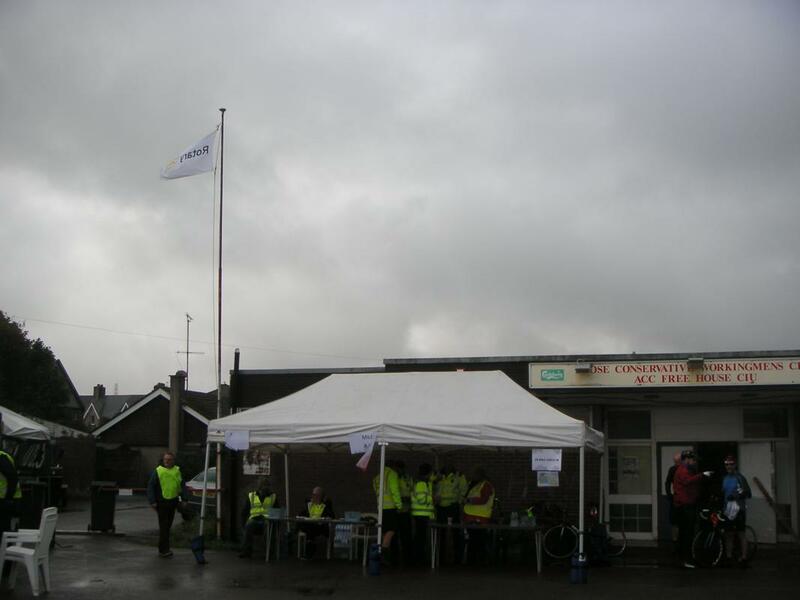 By 08:30 the first riders had arrived at Coniston and by 09:00 they had 15 riders through their control. At 10:00 our first rider was back at base, followed by the 2nd rider two minutes later. 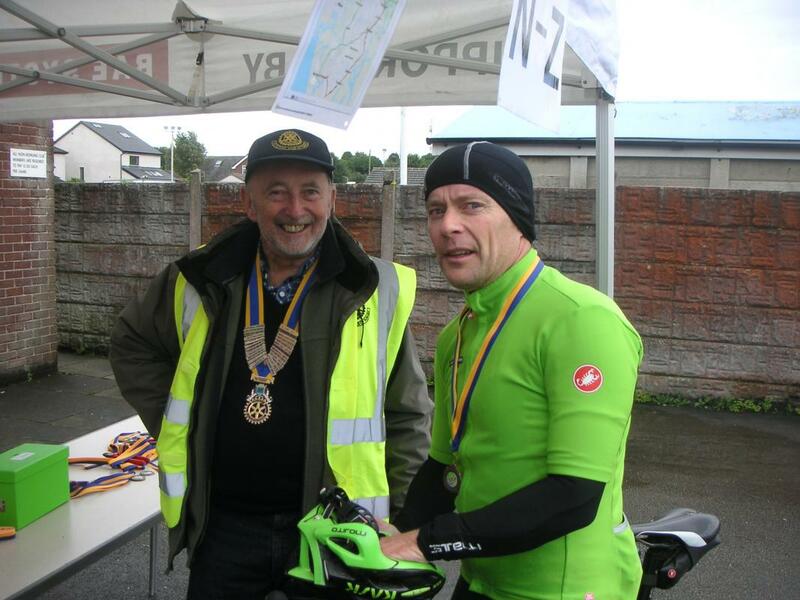 By 10:35 160 riders had passed through Coniston and by 11.05 it had risen to 172. The day was improving and riders were going out on the other rides, and our marshalls and refreshment stations updated on the latest rider numbers taking part. Our base refreshment area was also operating full blast, with lots of bacon and sausage buns being dispensed along with our usual vegetarian option. The tea and coffee urns were also bubbling furiously; the cold drinks and bottles of water were not so popular today. The day drew on and all of our riders had returned, although two had an accident and our first aiders referred them to hospital. They were later discharged OK. A few cycles had to be transported back by our sweep service but in the end we had had another successful Tour de Furness. 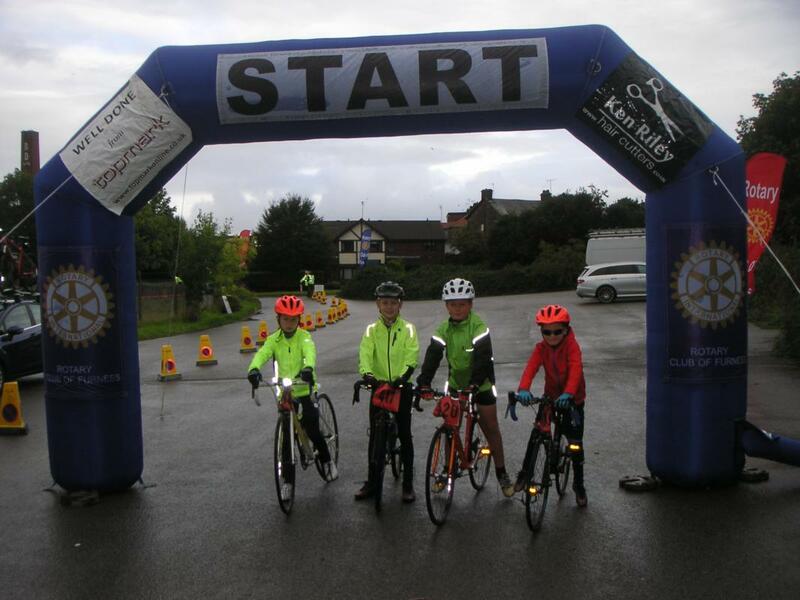 The weather was a bit of a challenge but in the end 324 riders had taken part, including our local MP John Woodcock. We have had lots of compliments from our riders and one world first rider also participating. 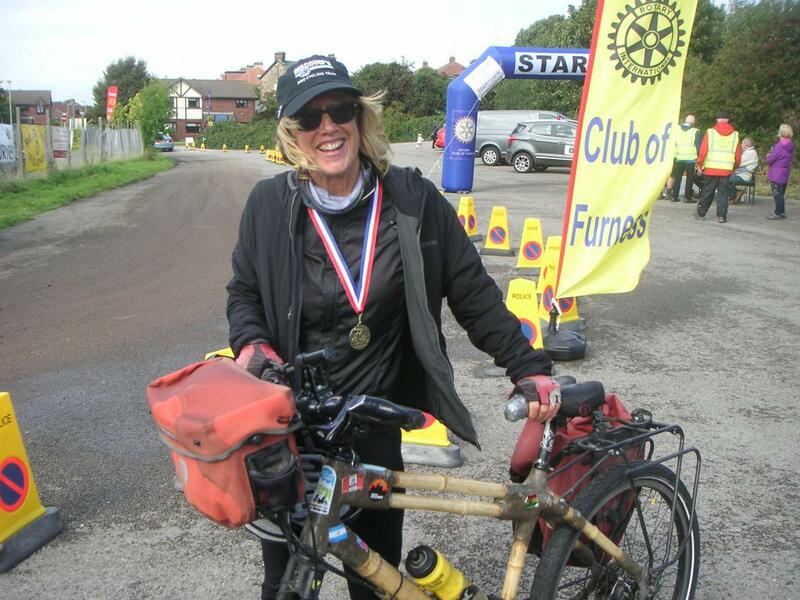 Kate Rawles rode on our 50 mile ride with her unique cycle, made of Bamboo, which she had ridden in a remarkable trip throughout South America, from Colombia to Patagonia - over 10,000 km ! Our 50 mile ride to Coniston and back was easy peasy for her !